Every so often some bureaucrat at the Pennsylvania Liquor Control Board screws up when filling out the computerized order form and ends up accidentally ordering 300 cases of some wine when he meant to order 30. When this happens, good wines go on sale. 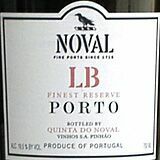 This has apparently happened with the Quinta do Noval LB Porto. Typically, this unpedigreed port would sell for between $15 - $18 a bottle. It's been on sale at state stores for $10, and I'm stocking up. Is it a great port? No. But it's a good port, and at $10 it's a steal. In a world where one has to pay $75 (!) for a bottle of Fonseca vintage 2000, there's something to be said for economizing on the stuff you drink when you're not celebrating a special event. This is one of those very rare occasions when I miss the incompetency of the Pennsylvania Liquor Control Board.